Greenskin Wars - The orcs are coming! Lots of new models for the existing Greenskin Wars metal miniatures range! By Kevin "Goblin Master" Adams! 171 backers pledged €14,922 to help bring this project to life. The purpose of this campaign is to get the funds to produce these new miniatures and also expand the range with new models and allies for them, such as more orcs, trolls, characters , etc. So, we will have a new cool race to add into the Greenskin Wars universe, the Orcs! My main goal is to be able to complete a unit of Orcs boar riders and prepare a regiment of orcs on foot too, for this campaign or a close following one if the funds allows me to do it. Material: All the miniatures are made of lead free white metal and are supplied unnassembled, unpainted and without bases (bases can be supplied at request for a small extra cost) I decided not to include bases because there's a wide variety of clients who want square bases for regiments , some round or hex for skirmish games... so we better avoid the extra cost of adding bases that you might not use in the end. The white metal is an awesome and very durable material able to keep very sharp detail, but while I check every order personally before sending, keep in mind the copies are not "perfect" and some complex or multipart models might need some pinning, cleaning or small adjustments. Most of this HUGE range of greenskins and related creatures are sculpted by the legendary ex GW sculptor Kevin Adams, who has an awesome taste for this kind of creatures. Most of the Trolls are sculpted by me. All the amazing art has been done by Johan Tieldow and "The Galapalo"
This are the main pledge options for the campaign. The system allows you to pick ONLY ONE, but thats not a problem at all, just select one want, and then if you want more just go to "manage my pledge" and increse your pledged ammount acordingly with the ones or items from the store you want to add. A survey will be sent after the campaign asking you which models has you paid for. This orcs are a delight for the oldschool lovers, with those "long face" features and their gnarly limbs. They come with detachable shields and the boars will have interchangeable heads. Hill goblins are the most common of all the goblin races and so they are the most powerful faction too. *Now including this variant musician for free! Goblin Knights: Famous goblin heroes to command your troops. Brutal creatures who live inside the northern caves, they usually follow their hobgoblins cave neighbours to war. The Feral Goblins:Feral Goblins are sneaky and quiet, they hide in the forest becoming one with the inviroinment. The doom goblins are creatures of the dark, they are more active by night and tends to live in caves and shadowed forest areas surrounded by lethal fungi . Black Goblins:The biggest and stronger of all the goblin factions, they see the other goblins as puny creatures they don't want to mix with. Wait! Do you want them all?? Here's the pledge you need! All the new content showed above in one single click, and also you'll save money and qualify for the Free Ogre goal miniature! Here there some main pledges or items that, while NEW has been unlocked or released after the campaign launching and so they ARE NOT INCLUDED on the "All the new stuff" main pledge for 110€. All the options shown in this space need to be added to your existing pledge/ammount. The Trolls! : This pack brings you three different trolls, 1 regular Hills troll, 1 Feral troll and Zhot N' Mogg the two headed troll at lower price than purchasing them as singles. Goblin Wolf riders with lance: Three new (there was 4 of them already that can be found at "The Store" section ) goblins with lance and three wolfs. Doom goblins boss! : Definetely the poor Doom goblins needed a great boss to command them, so here it comes!If you want to add this boss just increase your pledge by 5 € and will be all yours! Here will be shown the different goals to achieve along the campaign as the campaign progresses , they will appear once the previous goal has been hit. The first one coming after funding is not a bad one at all! Will give a free Ogre with ripper fists to all backers who pledge for a total of 60€ or above. Unlocked! And free for all 60€ or above backers! They will unlock at 7000 € UNLOCKED!! WIP of one of the three new boar riders! UNLOCKED!! There's a new main pledge for them at 45€ or you can just add them adding 45 € to your pledged total. Here's the first orc done!! At 11.500 € the Mushromms scenery will return! And featuring a new piece, stay tunned for it! 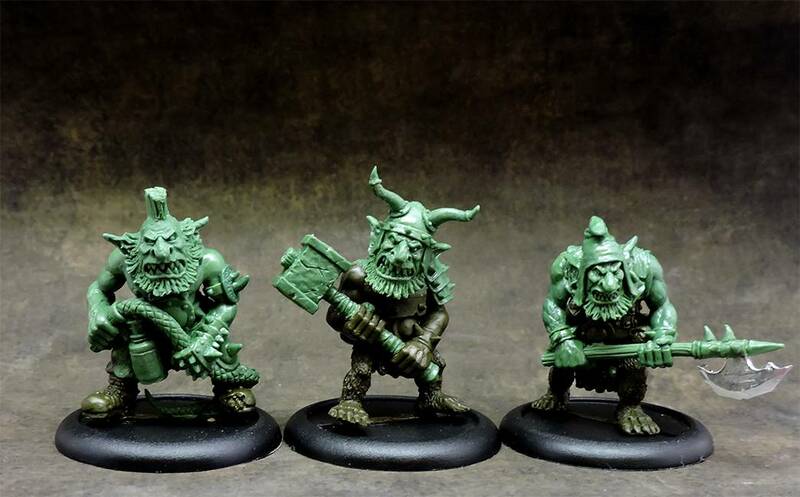 Here in the STORE you 'll find the whole Greenskin Wars miniature range. You can add as much as you want to your main pledge,in order to do that, just calculate the total cost of the items you want to add, then go to "manage your plegde" option and increase the pldged ammount accordingly. Thats all for now, at the end of the campaign you'll recieve survey where you can list those extra items you have paid for. Lots of characters to choose from! Trolls, Iron Orc, Orc Commander on warthog, Ogres, Tusker...there's a lot of mean creatures here! Click to see how "giants" they are!! 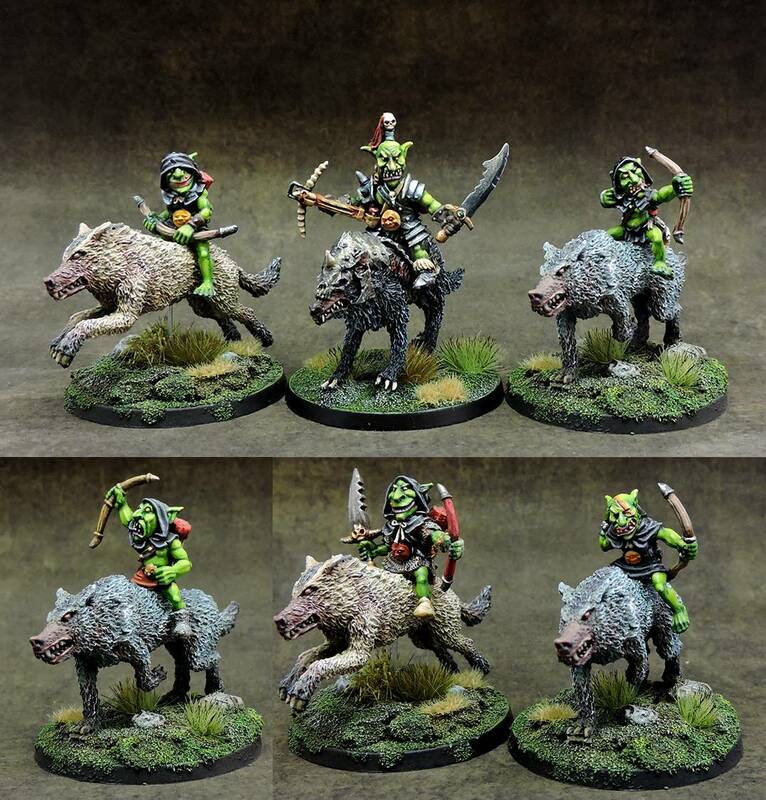 Goblin Wolf riders : Fast and agile troops to flank and hostigate your opponents! Goblins Scouts: Riding wolfs and attacking the enemies from the distance, the scouts are a big threat to your opponents!Champion on armoured wolf included! 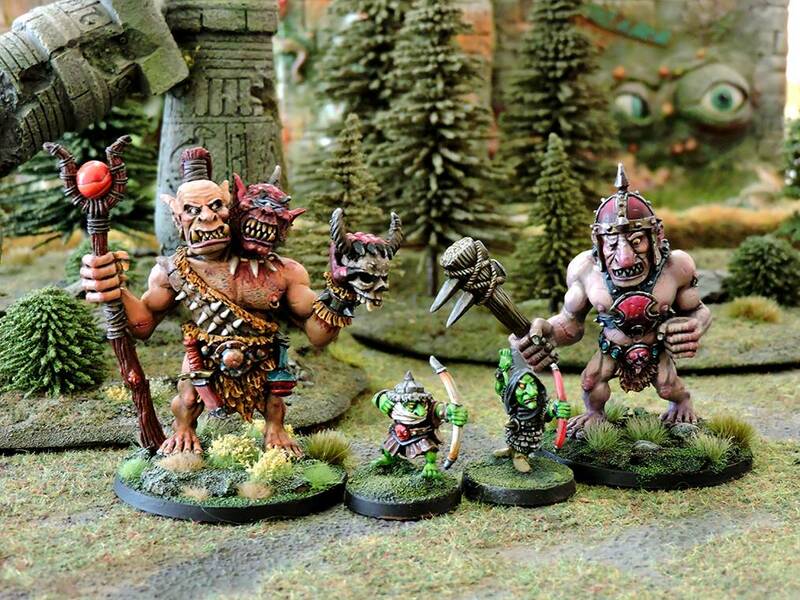 Feral Goblins: The fans favourite goblins are back! Use the reinforcement pledge too to increase their unit size! Doom Goblins: A full regiment of the nighty ones! 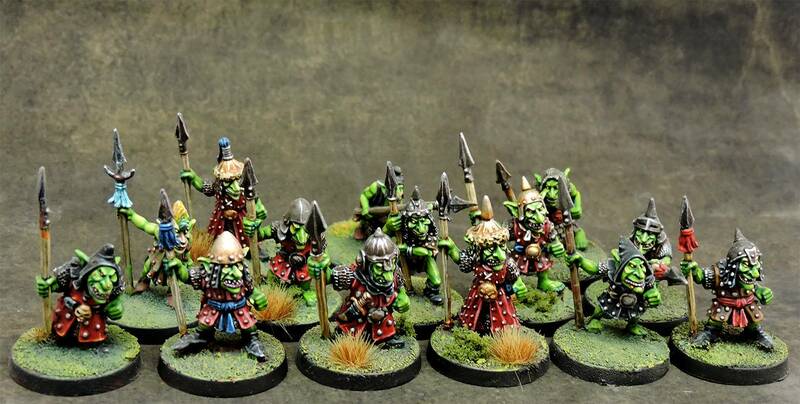 Hill goblins HORDE!! Get this horde of nasty goblins made up of 24 different models for the cheapest price! Including command group and leaders. Click on the pic to see them all!! Click to see the horde in HD !! Goblin Archers: Do you need firepower? This is the perfect bundle for you! 15 Different archer models for an unbeatable price! Click for a HD pic of them. Goblin lancers: 14 different mixed goblin lancers! All together now at a very cool price!! Click on the image for a FULL pick! Many more items and bundles will appear as the campaign progresses!! Shipping costs are NOT INCLUDED, and might vary a lot depending on the country and weight of your order. I'll always get you the better price for your order, always tracked, but if you want a higher priority just ask me. All the shipping costs will need to be paid before sending the orders, and I'll only ask for them once I have the miniatures ready to send and can offer you a very accurate weight/price rate. So I'm very confident now with my stimations BUT even though , keep in mind this are just "stimations" there's always room for delays , accidents or simply something may need some changes or fixes , and any of those things would affect the stimated times. This pledge allows you to support the campaign, get all the updates in your mail, write comments and ALSO be able to balance your contribution later if you change your mind, adding models or whatever. This pledge grants you four doom goblins troops as pictured. Any further unlocked goals could be added too. This pledge grants you three Feral goblins as pictured. This pledge grants you three Hobgoblins as pictured. This pledge grants you three Black goblins as pictured. This pledge grants you three goblin heroes or "Goblin Knights" as pictured. This pledge grants you two orc riders and two boars as pictured in their pledge image. This pledge grants you three powerfull bugbears as pictured. This pledge grants you the ten man Hill goblins regiment, including command group. This pledge will grant you the three trolls from the "The Trolls" option. This pledge grants you the full 10 orcs regiment. All different models, in the same classic style as the boar riders, including shields for those who need and of course sculpted by Kevin Adams. ALL THE NEW STUFF BUNDLE!! Get ALL THE NEW STUFF!! 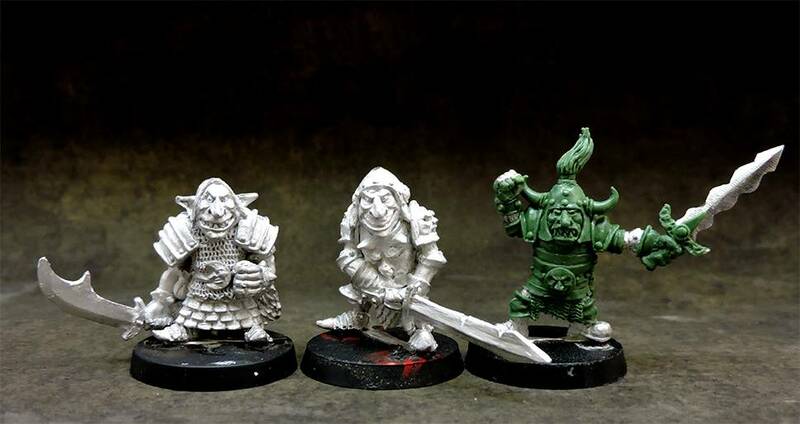 This bundle includes all the new stuff released as main pledges content: The Bugbears, Doom goblins, Hill goblins, Feral goblins, Black goblins, Hobgoblins, Goblin Knights and Orcs boar riders. Saving you 6 € from its total cost and also you'll qualify for the free Ogre once it gets unlocked.